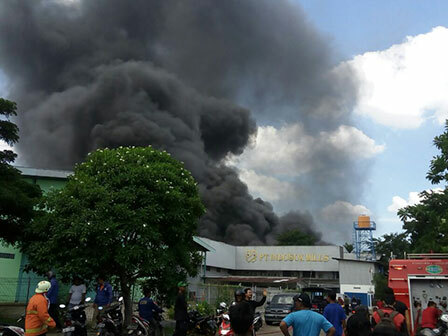 Fire gutted a rubber material warehouse in the Kawasan Berikat Nusantara (KBN) industrial bonded zone, Jalan Raya Cakung Cilincing, Sukapura, Cilincing, Saturday (3/31). Luckily, it was successfully handled after sending 13 fire trucks of North Jakarta Fire and Rescue Sub-dept. to the scene.
" Fire trucks arrived at around 11.35 AM, and managed to control the flames quickly"
North Jakarta Fire and Rescue Sub-dept. Head, Satriadi Gunawan stated that there were many flammable materials at the scene and made it difficult for officers to put out the flames. "Fire trucks arrived at around 11.35 AM, and managed to control the flames quickly," he expressed. There was no casualty reported in the incident. "The cause of fire and its material loss are still being investigated," he told.